The Denver Broncos were at 7-3 and on top of the AFC West as they hosted the San Diego Chargers on November 17, 1985 – a team they had lost badly to two weeks before. Coached by Dan Reeves, the Broncos featured third-year QB John Elway with a talented group of receivers led by Steve Watson while the ground game consisted of a running-backs-by-committee approach. The bend-but-don’t-break defense included SS Dennis Smith and CB Louis Wright (pictured above) – although their most notable accomplishments in this game would come on special teams. The Chargers, coached by Don Coryell, featured a pass-oriented offense with QB Dan Fouts throwing to wide receivers Wes Chandler and Charlie Joiner. Star TE Kellen Winslow was returning from a major knee injury suffered during the previous season and RB Gary Anderson was now fully integrated into the offense after coming over from the USFL. It was a sunny afternoon at Mile High Stadium with 74,376 fans in attendance. The Chargers started off with a bang as Gary Anderson returned the opening kickoff 98 yards for a touchdown. Bob Thomas added the extra point for the early 7-0 lead. The Broncos went three-and-out on their first series and, following the punt, San Diego accumulated three first downs on the way to the Denver 30. Dan Fouts completed three passes for 24 yards but the possession came to naught when Ralf Mojsiejenko’s 47-yard field goal attempt was blocked. 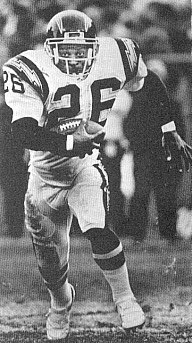 Following another short Denver series, Fouts again was moving the Chargers until a pass was intercepted by Louis Wright, who returned it 16 yards to give the Broncos good field position at the San Diego 44. The six-play drive, highlighted by John Elway throwing to RB Gene Lang for 24 yards, was capped by another Elway pass of four yards to WR Steve Watson for a TD. Rich Karlis tied the game with the extra point. The next San Diego series featured Fouts throwing to TE Kellen Winslow for 26 yards and reached the Denver 31 before the veteran quarterback was again picked off, this time by DB Randy Robbins. However, two plays into the second quarter, it was Elway suffering an interception as FS Miles McPherson grabbed the long pass and returned it 30 yards to the Denver 12. Three plays later, Fouts threw to RB Lionel James for a 12-yard touchdown. The extra point was successfully added to again make it a seven-point contest. The teams traded punts until, with just over two minutes remaining in the first half, the Chargers drove to the Denver 24, but a 41-yard field goal try by Thomas hit the right upright and was unsuccessful. The score remained 14-7 in favor of San Diego at the half. After the teams exchanged punts to start the third quarter, the Broncos gained possession at their 13 and proceeded to methodically advance to the San Diego 10. 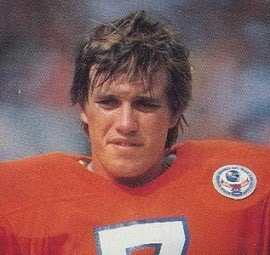 Elway (pictured below) completed five passes, but they came up empty when Karlis was wide on a 28-yard field goal attempt. Two plays later, Denver got the ball back when Anderson fumbled. As the game moved into the fourth quarter, the home team concluded a four-play, 14-yard series with Lang running two yards up the middle for a TD. Karlis added the PAT and the game was tied once again. Things went from bad to worse for the Chargers who no sooner got the ball back on offense when Fouts fumbled the snap and DE Andre Townsend recovered for Denver at the San Diego 19. Three plays later, it was Lang scoring again, this time from four yards out. Karlis converted and the Broncos had the lead for the first time. Fouts went to the air five times on San Diego’s next series, hitting James three times for 32 yards. The drive finally stalled at the Denver 19 and Thomas kicked a 36-yard field goal to narrow the home team’s margin to four points. 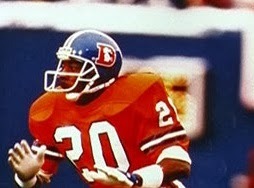 Elway passed the Broncos down the field but was intercepted by LB Woodrow Lowe. The Chargers had to punt and, following the next Denver series, the Broncos lined up to do the same. However, Chris Norman’s kick was blocked by CB Wayne Davis. Starting at the Denver 24, the Chargers proceeded to score a touchdown in four plays, with RB Tim Spencer running the ball in from two yards out. Thomas made it a three-point lead game with the Chargers now back in front at 24-21. There was just 1:09 remaining in regulation as the Broncos started their next series. Elway threw twice for 11 yards and then ran for five before tossing completions to RB Steve Sewell for six yards and WR Vance Johnson for 17 yards. A shovel pass by Elway to RB Sammy Winder was good for nine more yards and, with nine seconds left on the clock, Karlis booted a 34-yard field goal. The game went into overtime at 24-24. The Chargers won the toss to receive the kickoff for the extra period and methodically moved down the field. James had a 16-yard run and Spencer converted on fourth-and-inches with a one-yard gain up the middle. Fouts threw to Wes Chandler for 13 yards and Anderson gained six on the ground to reach the Denver 23. The drive stalled there but Thomas came on to attempt a 40-yard field goal to win the game. It appeared that the Chargers got a seemingly huge reprieve when the field goal try was blocked but they got the play back due to a timeout called by Denver right before the snap. However, on the re-try, Dennis Smith again blocked the kick and Wright picked up the loose ball, returning it 60 yards for a touchdown. There was no reprieve for the Chargers this time. In stunning fashion, the Broncos came away with a 30-24 win at 4:45 of overtime. In a game in which plays by the special teams were so significant, San Diego held a slight edge in total yards (340 to 331) and first downs (22 to 21). The Chargers turned the ball over four times, to two suffered by Denver. John Elway completed 28 of 50 passes for 261 yards and a touchdown while giving up two interceptions. Gene Lang rushed for 51 yards on 15 carries that included two TDs and also led the Broncos with 5 pass receptions, for 45 yards. Vance Johnson compiled 48 yards on his four pass receptions. For the Chargers, Dan Fouts was successful on 23 of 45 throws for 245 yards, with a TD and two interceptions. The versatile Lionel James (pictured at left) gained 64 yards on the ground in 15 carries and also caught 11 passes 93 more yards and a TD. The Broncos lost two of their next three games, both to the Raiders, and as a result finished second to that club in the AFC West with an 11-5 record and barely missed the postseason. San Diego came in fourth in the division at 8-8. John Elway led the NFL with 605 pass attempts and ranked second in completions (327) and yards (3891), but also interceptions (23). Dan Fouts, heading in the opposite direction of Elway at age 34, led the league in yards per attempt (8.5) and was tied for second in touchdown passes (27). He was selected to the Pro Bowl for the sixth (and last) time. Lionel James was a productive all-purpose performer throughout the season. Undersized at 5’6” and 170 pounds, he was nicknamed “Little Train” and set a new NFL record with 2535 total yards. That figure consisted of 515 on 105 rushing attempts, 1027 on 86 pass receptions, 213 on 25 punt returns, and 779 on 36 kickoff returns. It broke the previous record of 2462 set by Terry Metcalf of the Cardinals in 1974 and remained the standard until 2000, when Tennessee’s Derrick Mason accumulated 2690 yards.